An upright cannon in a small triangular park at Wilkinson Drive and Glenwood Avenue, near the I-20 interchange, marks the spot where Confederate Major General William H. T. Walker was killed. Park on the east side of Wilkinson Drive, just north of the Walker Monument. 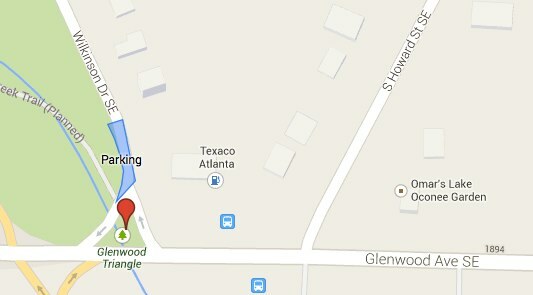 Park on Wilkinson Drive after right from Glenwood Avenue. The best parking area is marked in blue on the map below (click for a larger version). The Walker Monument is the upright cannon marked by the red pinpoint on the map.